I wasn’t kidding was I? Now we have a new president. While watching the coverage yesterday I had a flashback. No not acid. I had a flashback to the day 27 years ago that I visited Graceland. It wasn’t Graceland itself, but the business that had popped up mushroom like in about a two mile radius. The Elvis industry was in full flower. There were Elvis souvenirs that you wouldn’t believe. Now we stand on the cusp of economic recovery beginning with the industry of Obama-mania. I’ve seen every type of Obama t-shirt one could dream of. Obama buttons are everywhere. I haven’t seen any, but I know there will be Obama tapestries ala the JFK tapestries of the 6o’s. From what I saw on the streets surrounding Graceland, my imagination doesn’t have the chops to come up with what some people will. 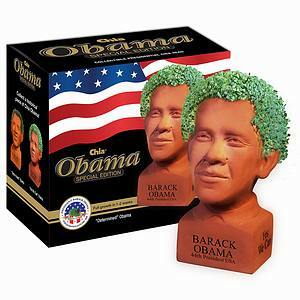 Barack and Michelle Salt Shakers, Obama sofa thows, letter openers, snow globes, lunch boxes, Coffee mugs, There will be knock-offs of the First Lady’s dresses. This page took 0.747 seconds of computer labor to produce.